Main Street USA in a slide I took in 1983: Well, at least you can still see Sleeping Beauty Castle through the forest. Disneyland remembered the real meaning of Memorial Day with a ceremony honoring fallen vets during the flag lowering at the end of the day at Main Street Plaza. California Adventure – 1983 and now: The top photo is the Disneyland Parking Lot where California Adventure is today from a slide picture I took in 1983. That was in “Section G as in Goofy”. It’s a busy weekend in San Francisco, this one is. Today is the Bay to Breakers Race. This evening Kim Novak will be at the Castro Theater for a screening of Alfred Hitchcock’s 1958 film ‘Vertigo’ celebrating the 60th anniversary of its release. And yesterday was the Veterans Memorial Cruise aboard the SS Jeremiah O’Brien. The cruise honors veterans living and dead and a wreath laying ceremony is conducted on the voyage each year for some of the veterans lost. Once again I relied on http://opensfhistory.org/ for vintage pictures to compare with some of the photos that I took along the journey. There were a surprising number of World War Two veterans on hand and some interesting uniforms. There were also a number of authors who have written books on military subjects autographing their books. We departed Pier 45 on a windy but beautiful day. This is Russian Hill in 1955. The street climbing the hill in the center of both pictures is Hyde Street. We sailed around Telegraph Hill, seen in 1927 without Coit Tower. We’re approaching the Ferry Building, seen in 1968. That’s the Bank of America Building going up in the old photo. There was no Hyatt Regency and no Embarcadero Center yet. The Bank of America Building, not the “king of the hill” anymore, can be seen on the right along with the Alcoa Building in my picture. We’re lined up with the Ferry Building at the foot of Market Street seen in 1906 with scaffolding around the tower to repair damage from the earthquake. We’ve sailed under the Bay Bridge and you’re looking at the western most tower of the bridge being erected in the 1930’s. The old Hills Brothers Coffee Factory can be seen in both pictures. Now we’re at the China Basin, now called McCovey Cove after the San Francisco Giants slugger. The vintage picture is circa 1922. Just behind that ship is where AT&T Park is now. The baseball park was quiet and empty when we sailed past, but it was crowded and loud later in the evening when the Giants beat the Colorado Rockies 9 to 4. Now we’re cruising past Potrero Hill. The gas and water towers are gone now, but the smokestack from the old Potrero Generating Station is still there. When we reached Hunters Point a moving wreath laying ceremony was held. I noticed that none of the ships or boats on our horizon were moving as well, so I wondered if they were respecting the ceremony also. However, an old salt on the Jeremiah O’Brien said that they were just waiting to be guided into port by a port harbor boat. I don’t know about that though, the little boat among them didn’t need guiding in! We headed back to town by a different and interesting route. It was time to relax, like these ladies on a ferry boat were doing in 1954, and enjoy some of the free coffee, donuts, hot dogs, and beer. Our return trip took us under the new Eastern Span of the Bay Bridge that replaced the old cantilever span, seen in 1960 in the vintage picture. The Eastern Span opened in 2013. And under the bridge we went! That’s the first time I, and probably most of the people on board the Jeremiah O’Brien, had ever done that. So, we headed back to Fisherman’s Wharf, guided in by tug boats. That’s the old sailing ship Balclutha that used to be docked at Pier 43 in the 1964 picture. There was no Bank of America Building, Transamerica Pyramid, or Salesforce Tower back then, and two of the more cherished buildings in the old photo, Coit Tower and Saints Peter and Paul Church, can still be seen. Powell and California Streets: I had a nice line up on this one, I wish it had been a clearer day. Ah, the entrance to the mystic world of Chinatown! You know that you’re in an exotic location when the signs read ‘Country Burger’ and ‘Coca Cola’ at the entrance. “Sign, sign, everywhere a sign”: There are still a lot of signs in Chinatown today, but they’re not “breakin’ my mind” like in that old 70’s song, and the red lanterns of nowadays are an added improvement. The old Crocker Bank on the corner of Montgomery and Post Streets: This was the bank where Lee Remick’s character Kelly Sherwood worked in the 1962 film, ‘Experiment in Terror’. Crocker Bank is defunct now and the top floors of the building were removed at the end of the 1970’s for a rooftop park. It was a lot prettier of a day in San Francisco today when I finished this set than it was a few days ago. In fact, it was about the nicest spring day I’ve had in town so far. I was trying to figure out why Alcatraz Island seems to tilt so much in the older picture looking down Hyde Street after you pass Chestnut Street. Of course, it’s partly due to the photographer, but it actually does seem to slant as you move further down from Chestnut. Probably because Hyde doesn’t run directly toward Alcatraz. Or maybe Alcatraz does tilt occasionally and no one has ever been able to figure out why. They used to call this peaceful portion of Aquatic Park on Beach Street Victorian Park, but I don’t know if anybody calls it that anymore. The Ben Jonson Restaurant in the old Del Monte Cannery Building near Fisherman’s Wharf was very popular in the 1970’s. They served mostly recipes from England, but I’ll bet they didn’t serve Yorkshire pudding! If I have critics, and nobody’s worth much if they don’t, “Woe unto you, when all men shall speak well of you”, they’ll probably say, “He’s always posting pictures of the same spots.” There’s truth in this, but I always feel that the website isn’t about my pictures; they’re, at best, pleasant snapshots. However, the vintage pictures are what it’s all about. 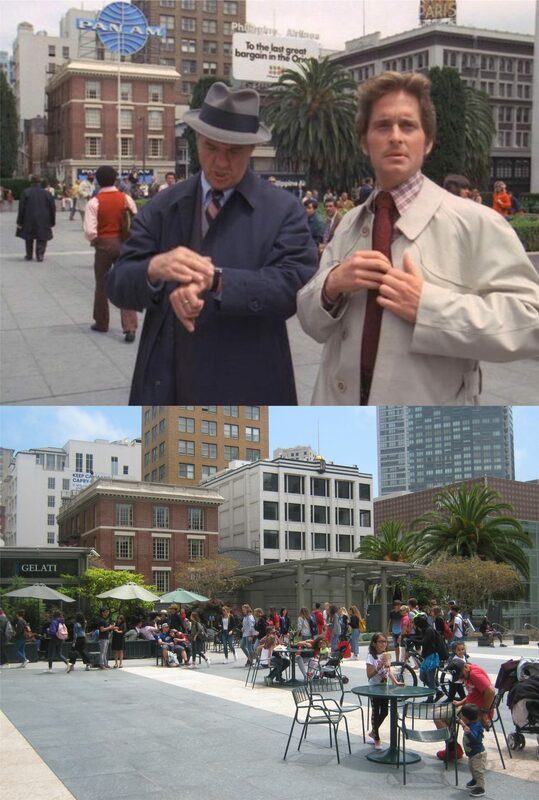 I’ve probably posted dozens of pictures at the Powell and Market Streets cable car turnaround, but I keep discovering new pictures from the past of this location and these are what make a then and now comparison fun to look at. In short, sometimes when I post these pictures, “this I do for me.” The long cable car lines of today hadn’t really started forming yet back then and, surprisingly, the line a couple of days ago when I took the current picture was smaller than they were in the 1970’s! I took a few drives around San Francisco this Mother’s Day weekend enjoying the perfect spring weather. I was thinking about how lucky I am; I can’t anymore, but for at least a half of a century I got to wish my mom a Happy Mother’s Day. As I drove around checking out some new sites, I also stopped at a few places my mom visited long ago. I visited Corona Heights for the first time ever: I can’t believe that all these years I’ve never been up there! Also on Corona Heights is the Randall Museum of Science, Nature and the Arts and its many wildlife exhibits. But seriously, this is a very interesting museum well worth visiting. Before they closed it off, I had a chance to locate the spot where my mom, on the left with her cousin Frances, was sitting on the old stone W.P.A entrance to Fleishhacker Zoo. They’ve fenced the old entrance off now, either to keep people from sneaking into the zoo, or animals from sneaking out. Some, someday moms at the old Fleishhacker Pool: The girls in the picture from the Shorpy Archives are posing in 1927, two years after the pool opened. I’m standing on top of the pool in the current picture; the pool was filled in and is buried under the San Francisco Zoo parking lot. That’s the entrance to the old pool house on the left in the modern picture, the only thing remaining of Fleishhacker Pool. That’s my 17 year old mom on the left swimming in Fleishhacker Pool on her first visit to San Francisco. If she looks miserable it’s probably because the water in the pool was rumored to always be cold! Up until 1906, and even after that for awhile, the SOMA, South of Market Area, was called “South of the slot”. This referred to the cable car lines that ran along Market Street. The “slot” is the portion of the cable car track in the center that tethers the cable cars on to the running cable under the street that moves the car along. The powerhouse at Mason and Washington Streets keeps the cable running. The rattling noise in the slot is one of the sounds that many, including myself, love about San Francisco; the foghorns, the Ferry Building siren, the clanging bells of the cable cars, the jerks standing at Market and Powell Streets screaming into a bullhorn that you’re going to go to Hell if you don’t repent. Well, maybe we could leave that last one out. I took the Muni # 10 to get to Powell and Jackson Streets yesterday to walk along the Powell Street “slot”. I finished my walk at the Powell Street turntable at Market Street; it looks like a World War Two era picture in the vintage photo. That was a nice spring walk! I felt like turning around and heading back, but Powell Street is a lot more of a climb from this direction. Spring makes me lazy and I wasn’t in the mood for that much exercise. In 1957 Doubleday and Company published Herb Caen’s guide to San Francisco, aptly titled ‘Herb Caen’s San Francisco’. Very imaginative! It’s deliciously outdated and fun to read with entries like “STEINHART AQUARIUM, open 10 A.M. to 5 P.M. daily, no admission charge. Easily the most popular attraction in the park, the aquarium draws as many as ten thousand visitors a day, all walking around openmouthed in the semidarkness to stare at the openmouthed fish.” John Steinbeck once wrote, “It is very probable that Herb’s city is the one that will be remembered.” However, what interests me most about the book is the map on the inside of the front cover and first page. There is no explanation in the book as to why the route was laid out. In some areas it’s similar to the famous 49 Mile Scenic Drive, although shorter. Oddly, it bypasses some of San Francisco most visited tourist attractions, such as the Golden Gate Bridge, the Cliff House, Twin Peaks, Mission Dolores, and Union Square. The trail starts on Mason Street and ends on Mason Street. I followed the mysterious route over last weekend doing then and nows of photos along the way from OpenSFHistory.org. The OpenSFHistory.org site has one of the best, if not THE best, collection of vintage San Francisco pictures to be found. So let’s get our exercise and follow along on Herb Caen’s 1957 map from Mason Street to Mason Street. We’re off! We’ll start on the west side of the Mark Hopkins Hotel with these two dapper gentlemen from 1958. The trail heads down California Street turning north onto Grant Avenue. We’re in 1943 now with these ladies and next to Old St Mary’s Church. We move past Commercial Street in the 1930’s. Commercial is one of two streets that leads straight to the Ferry Building, the other being Market Street; although, Commercial Street is cut off from reaching the Ferry Building now by the Embarcadero Center. The route leaves Chinatown and heads northwest along Columbus Avenue. We’ve come forward a little in time to 1971 here at Columbus and Union Street. The 39 Bus is crossing Columbus Ave along Union and heading up to Coit Tower. The 39 line still passes by here and I wanted to get a picture of a coach going by in my photo, but the street is closed off now due to a massive fire that destroyed the building on the southwest corner of the intersection several weeks ago. This is what’s left of the building now. Like the 49 Mile Drive, the route heads up Lombard to Coit Tower, seen here in 1962 where Greenwich Street that runs next to Lombard ends. Hey, it’s going to be a long trip, so, I didn’t feel like going all the way to the top, okay? The trail passes by the Fisherman’s Wharf boat lagoon on Jefferson Street, seen here in 1936. Oh, swell, it’s Mrs. Danvers! (cf. ‘Rebecca’) “Now, sit right back and you’ll hear a tale, a tale of a fateful trip” Don’t worry, that’s the ‘Lovely Martha’ not the ‘Minnow’. I’ve been out in the Bay on that boat. The building with CONSOLIDATED on it was demolished and was to the right of the little brown chapel in the background. After leaving Fisherman’s Wharf the map moves over to Bay Street and takes a strange diversion from the 49 Mile Drive and runs south along almost the entire length of Van Ness Avenue to Fell Street. We’re watching President Franklin D. Roosevelt’s motorcade, here on Van Ness near Bay Street, pass by in 1938. Fort Mason is in the background. At the other end of Van Ness, we’ll turn onto Fell Street. This is Van Ness at Fell after the 1906 Earthquake and Fire. The crumpled City Hall Building is in the background. We’re heading west on Fell Street, the street that many people take to get to Golden Gate Park. The 49 Mile Drive does not move along any portion of Fell Street. This view is looking east down Fell from Fillmore Street in 1939. The trail enters Golden Gate Park where we’ll stop and rest at McLaren Lodge like they did here in 1905. Superintendent John McLaren, the mastermind behind Golden Gate Park, lived here for forty seven years. The route crosses through the park and exits near where Playland-at-the-Beach used to be, and was when the map was drawn. If we were in 1941 at Fulton Street and La Playa, like the vintage photo, we’d be looking at a terrific roller-coaster instead of these condominiums here today. Now we’re back neck to neck with the 49 Mile Drive in a race south down the Great Highway. We’ll stop here at Ocean Beach near Kirkham in 1916 to look at the sad wreck of the Aberdeen on the beach. High winds caused the ship to capsize and wash ashore here taking all eight of her crew down with her. Let’s move down the Great Highway to Taraval Street and look back up north three years later in 1919. We’ll turn east on Sloat Blvd. and stop for awhile as they move an old train into Fleishhacker Zoo, now the San Francisco Zoo, at the old stone Works Progress Administration entrance in 1957. Hmmm, I’m suddenly hungry for a Doggie Diner hamburger. Now, we’ll move on to Portola Drive and bypass Twin Peaks like Herb Caen’s map did. Hey, I love the view up there but there’s no parking! The old photo is Portola Drive at Twin Peaks Blvd. in 1929. You can see part of the old road that headed up to the top of Twin Peaks on the left. Sneaking past Twin Peaks and dropping down a few notches will put us on Market Street heading toward Downtown San Francisco. Here we are at Market Street and Duboce Avenue in 1945 near the new, old U.S. Mint. We’re looking back toward Twin Peaks. We’ve moved to the beginning of Market Street, or, if you were heading in our direction, the end of Market Street. It’s probably a sin for any respectable tour route to leave the Ferry Building out and this 1957 one doesn’t. We’re back in 1962 again, and this is where California Street meets Market. You can see the cable car tracks in the old picture, but not much activity. We’re in the home stretch now and heading along Pacific Avenue, the heart of the old Barbary Coast. This is the old Engine #1 Fire Station Building seen here in 1917 and still there today. Well, we’re back on Mason Street at Pacific Avenue in 1960 and looking up Nob Hill to where we started from. I don’t know about you, but I’m tired! I’m not walking up that hill! I’ll take the cable car. About thirty miles southeast of San Francisco is another Bay Area town as dear to my heart as San Francisco. It’s the town I grew up in, Castro Valley. The Castro Valley News Facebook page has some terrific vintages pictures of Castro Valley on their site, and on Easter Sunday I got a chance to drive and walk along Castro Valley Blvd. to do some then and nows on some of the many photos on their page. A lot of these pictures bring back special memories to me of a town that was fun to grow up in. On the western side of Castro Valley Blvd. is the McDonald’s, opened in the 1960’s and still there today, although, the original “Golden Arches” are long gone. What you’re looking at here was about all there was to Castro Valley Blvd. in the 1930’s; the section between Lake Chabot Road and Stanton Avenue. Some of the buildings in the old photo are still there. Opened in 1949, the Chabot Theater is still drawing them in today. Watching a film here is like stepping back in time. I sat through a lot of double features here as a kid, when such a novelty existed. Across the street from Chabot Theater was one of our hangouts in the 70’s, Jenna’s Pizzeria. They had a room with pool tables and a small bar in back of the dining room, and a pretty girl named Sue who made sure your beer pitcher was never empty. The southeast corner of Castro Valley Blvd. and San Miguel: No, this isn’t a scene from ‘That 70’s Show’. Directly kitty-corner from the previous picture on the northwest corner of the intersection is this view of a 1976 Bicentennial celebration. On the far left was Winchell’s Donuts, THE place for coffee and donuts in Castro Valley for many years. Another sad memory when walking along the Blvd. today is the old Daughtrey’s Department Store; closed in the early 1990’s. Across the street at center is the Castro Village, opened in 1948 and a world in itself. And, of course, Castro Village; designed with the look of an Alpine village, which new developers are sadly getting rid of as much as they can. The toy shop, variety store, and ice cream parlor were “the stuff that dreams are made of” when we were kids. This view is the corner of the Village at Santa Maria and Castro Valley Blvd in the 1970’s and today. Ah, the old Red Barn Restaurant, our hangout when I was a junior in high school. We usually never had enough money for more than a a coke and a bag of French fries, but we’d sit there for hours and nobody working there minded. It’s now called Norman’s Restaurant. We’ll end up on the eastern side of the Boulevard and another wonderful memory for me. This building opened up as Value World. They had everything there; a sporting goods section, a snack bar, a grocery store, anything you could want! I remember spending nearly an entire day in the 8th grade walking around Value World with a girl that I had a crush on named Cindy. I’m sure I spent all of my money on her, but I probably didn’t have more than a dollar anyway! It’s now a Rite Aid, and I still think about that day and Cindy every time I go in there.